Erected by D R and W McDonald in memory of their father. Alexander McDonald died at Achastle 26th January 1857 aged 42. Wife Jane Nicol died at Glasgow 26th July 1883 aged 67. Son John died in infancy. Son Alexander McDonald died 7th Febuary 1866 aged 22. Amelia S McDonald died at Swiney Hill Lybster 17th July 1905 aged 27 daughter of Robert McDonald and Janesina McDonald. 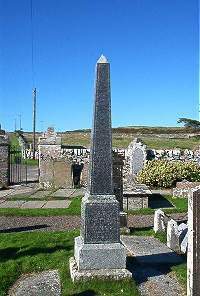 Donald McDonald died at Swiney Hill 18th December 1911 aged 73. Catherina McDonald died 14th March 1878 aged 1 daughter of Albert McDonald.